The science of behaviour change and animal training grew up separately. Like first cousins separated by culture and language, they knew one another, but didn't get to see each other very often. Karen Pryor’s Don’t Shoot the Dog planted the seeds for a giant reunion by linking the two disciplines. Over the years, pioneering trainers like Karen Pryor, Ken Ramirez, Kathy Sdao, and Michele Pouliot have used behavioural science to inform, refine, and extend their training across species. Pioneering behavioural scientists like Susan G. Friedman, Ph.D and Dr. Jesús Rosales-Ruiz informed their research and teaching with the practices of the world’s best clicker trainers. For the last 15 years, top trainers, scientists, and animal caregivers have come together at ClickerExpo to create a wealth of knowledge about science and positive reinforcement. 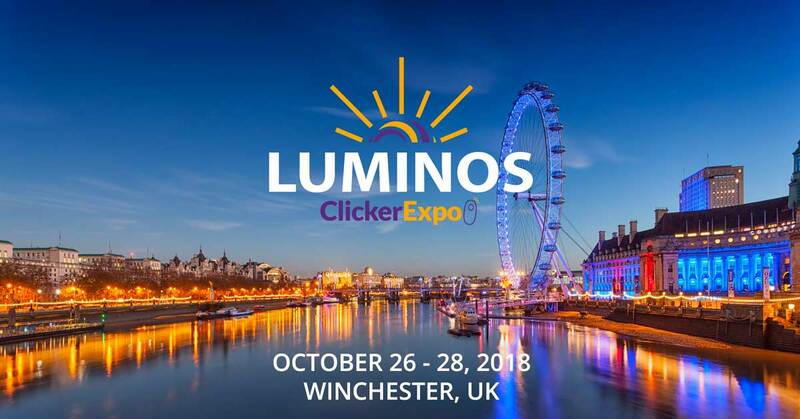 Now, welcome to an evolution of ClickerExpo, exclusive to the UK in 2018... Luminos. Let the light of our community shine in. 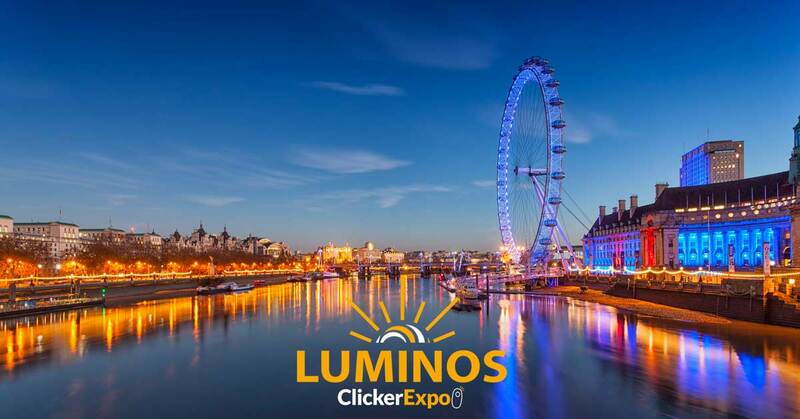 ClickerExpo kicks off on Thursday evening with a complimentary Welcome Reception. Come and meet our sponsors, browse the store and enjoy a complimentary glass of prosecco as you check in at registration and settle in for an exciting weekend. What does joy feel like to you? Is it the same for the person sitting next to you? Is it the same for your dog? Are emotions pre-wired in the brain or are they learned? Is the topic of emotions even relevant to training animals? These are just a few of the interesting and important questions that surround the topic of emotions. In this Session, we will focus on two contemporary approaches to understanding emotions, approaches that have upturned the commonly held classical account. The classical account is that brains come pre-wired with neurons dedicated to specific emotions that feel the same to everyone, and look the same to all observers. Instead, the latest neuroscience “theory of constructed emotion” suggests that beyond the basic affects (positive, negative, calm, and aroused), emotions are learned. This account of emotions fits neatly with the behavior analytic view that emotions are “contingency descriptors,” i.e., that feelings describe the behavioral contingency at hand (positive reinforcement, negative reinforcement, etc.). The benefit of understanding more about human emotions is clear, but what does it all mean regarding the animals we care for? Let your mind relax and refresh during this brief break! Coffee, tea, and a selection of snacks will be available. All faculty members will further discuss Emotions: Inside Out. Join fellow attendees for lunch at the hotel before beginning the afternoon programming. This meal is included with registration. Are errors beneficial to learning? Does “error-free” learning create superior behavior? How do mistakes help or hinder the learner? Do errors develop resilience? Is it even possible to ensure that learning is errorless? If errors do have the capacity to support learning, how do trainers avoid negative outcomes (e.g. decline in confidence, increased mistakes)? This topic on errorless learning versus learning with mistakes will lead you to ponder your own training program. In this Session, Michele Pouliot will explore how these questions have impacted her 45 years of training horses, guide dogs for the blind, and dogs for competition sports. In Michele’s first 25 years of experience, she trained through traditional methods that relied on using errors to train dependable behavior. Her last 20 years of training have been filled with discovery through practicing positive reinforcement methods. Through these extremely contrasted experiences, Michele will delve into the hot topic of errorless learning versus learning with mistakes. Michele will demonstrate applying errorless learning and planned-error learning in training the same behavior. Following the demonstration Michele will be joined by Dr. Jesús Rosales-Ruiz and Ken Ramirez for further discussion on Making New Mistakes. Make new friends and professional contacts while enjoying hearty appetizers this evening! We’re combining a fun, structured networking event with prizes, music, socializing, food, and a cash bar. Fill your stomach and your personal organizer at the same time! You’ll be exchanging ideas, contacts and more. Don’t forget your business cards! Add this event to your registration by 11:59pm on the 20th September 2018. Please note, prices are for advance purchase only and no on-site purchases will be available. What is the most positive and effective approach to dealing with animal errors? How do we effectively keep our animals engaged and avoid frustration when they make a mistake? What is the LRS (Least Reinforcing Scenario)? Is the LRS the best tool, and what does the science say about it? As a focus on positive reinforcement spreads, what other techniques are trainers using to deal with animal errors? What do current science and practice suggest is the next and best iteration for dealing with animal mistakes appropriately? Ken Ramirez has used the Least Reinforcing Scenario for the majority of his career and has found it to be an excellent tool for responding to certain types of animal errors. Susan G. Friedman, Ph. D has explored this technique with Ken and investigated the variety of ways that trainers use and teach this tool. This collaborative effort has uncovered a variety of similar but unique procedures employed by positive reinforcement trainers throughout the world. A description of these techniques and an evaluation of the underlying science will be provided and discussed by Ken and Susan. These tools will be compared and contrasted with some of the other popular error-reduction tools, such as non-reinforcement markers, timeouts, and extinction. Ken will demonstrate the use of some of these tools. Following the demonstration Ken will be joined by Susan G. Friedman, Ph.D., Michele Pouliot, and Kathy Sdao for further discussion on To Err is…OK! Are operant and classical conditioning as distinct and separate as is often claimed? What does the scientific literature have to say about this? Are cues and other signals learned through classical conditioning, or is this an operant process? When you look at the underlying processes of operant and classical conditioning are they really separate things? This presentation will review research that examines and re-evaluates the distinction between classical (aka Pavlovian or respondent) conditioning and operant conditioning. We will discuss various ways to look at these procedures and how this information can be applied to animal training. Animal trainers have developed many different procedures to change the behavior of their animals. Some of these procedures have been derived from knowledge about classical conditioning, such as desensitizaition and counter-conditioning procedures. Other procedures have been derived from knowledge about operant conditioning, such as shaping and chaining procedures. On paper, it may seem easy to identify when classical conditioning is occurring and when operant conditioning is occurring. However, during actual training situations it becomes less clear if what the trainer says is happening is actually what is occurring. For example, a trainer may say that she is following a classical conditioning procedure to change an animal’s unconditioned response to a certain stimulus. However, upon closer examination, it may appear that operant conditioning is at work instead. So, how do you know if what you are doing is classical conditioning, a mix of the two processes, or all operant conditioning? When trainers talk about animals learning cues, they often discuss the topic in terms of classical conditioning. Over repeated pairings, the animal learns an association between an environmental signal and the delivery of food (or another reinforcer). For example, your new dog learns to come running with excitement when he hears you opening the dog-food bag. Is there any operant learning happening here? And, how about associating the word “sit” with the behavior of your dog sitting? Is this classical or operant conditioning? And what about when you pair the clicker with food, are you using entirely classical conditioning, or is operant conditioning also going on? Historically, the distinction between classical conditioning and operant conditioning has been useful for both researchers and practitioners, including animal trainers. However, there are some people in the scientific community who see these two as a continuum from classical (unconscious) to deliberate (conscious) learning. Others believe that the two cannot be separated, and both are always occurring. As Bob Bailey says, “Pavlov is always on your shoulder.” Still others want to erase completely the distinction between the two. Procedurally, classical conditioning and operant conditioning appear to be two different things. But, what about when you examine the underlying processes? Are they really two separate things? Jesús will be joined by Susan G. Friedman, Ph.D. and Ken Ramirez for a further discussion on Is it All Operant? Join us for a book and media signing with the Luminos faculty. Whether you pick up a new book or DVD, or you bring your favorite with you, you’ll get the chance to meet renowned authors and experts one-on-one. Join Ken Ramirez as he shares incredible stories of creative trainers and their contributions to conservation. From sea otters to wolves to elephants and many species in between, successes abound in the expanded use of husbandry behaviors for conservation research, remote training projects, and the introduction of species to the wild. Come and be inspired at Saturday evening’s Gala Dinner, presented by Pet Remedy. Seats are available to attendees on a first-come, first-served basis until 10th August 2018. After that, seats will be made available to the public. You may make changes to meals on your registration until 11:59pm on the 20th September 2018. Does our core ethic—“positive-reinforcement works and coercion is dangerous”—include verbal behavior, that is, the ways we use language both spoken and written? Are we as force-free with our clients and colleagues as we are with the animals in our care? Can the unconditional positive regard we have for every furry and feathered animal we meet extend to every man and woman we speak with? Even on Facebook and Twitter? Even when we think that person is ignorant, cruel, or just plain wrong? Do the answers to these questions have any bearing on the high rate of burnout in the training profession? The work of training and behavior-consulting often takes place amidst emotionally charged situations. The stakes can be high and clients can be upset, argumentative, and unpleasant. Additionally, these same characteristics sometimes describe our colleagues—and our competitors. However, when speaking with challenging people we can also apply the core skills of careful observation, controlled emotionality, gradual shaping, and timely reinforcement of alternate behaviors. This presentation will examine a few specific formats for compassionate communications. Should you choose to extend the tenet “do no harm” to include verbal behavior, there are some key practical changes that will support your commitment; we’ll discuss these. Kathy will use a role-playing demonstration to illustrate some of the methods discussed. Following the demonstration Kathy will be joined by Susan G. Friedman, Ph.D., Michele Pouliot, and Ken Ramirez for further discussion on Mark My Words. “ChoiceandControl” is Not a Single Word! What do we mean when we suggest that we want to give animals control? Is it possible to give animals true choice? How are choice and control different? How can modern trainers use these concepts to facilitate animal learning and improve animal welfare? Over the last 20 years, animal research and training successes have blown the lid off our understanding of what animals can learn. With this information comes new appreciation and greater responsibility to the animals on the planet. Many trainers now find themselves on a different path than past generations, as we forge a contemporary view of what animals need to thrive among humans. Perhaps the most profound change in training is the move from a command approach to learning partnerships, in which environments are thoughtfully arranged to afford animals more choices with which to control their outcomes. However, we should resist the allure of memes and fads when providing best training practices. In this presentation, Susan will discuss key scientific evidence that supports the understanding that control is essential to behavioral health. Ken will share his case study showing how the choice to say no increased an animal’s control and improved participation and learning outcomes. All faculty members will further discuss “ChoiceandControl” is Not a Single Word! Conference programme and speakers are subject to change.